Three weeks back, we wrote that the Singapore Land Transport Authority (LTA), is planning to release a taxi booking app to better cater to the needs of commuters by helping them locate taxis in their vicinity and also, helping the drivers locate you. And indeed they did: announced earlier today, the new app called Taxi-Taxi@SG is made available today both on the Google Play Store and the iOS App Store. The catch? Unlike third-party taxi booking apps like GrabTaxi, Easy Taxi, Uber or Hailo which allows you to book taxis, the Taxi-Taxi@SG only shows you available taxis nearby. As a commuter spoilt with taxi booking app choices from third party apps such as GrabTaxi, I’d expect LTA to not just aggregate available taxis from all taxi operators, but more importantly, allow bookings to be made. The only advantage for the LTA Taxi-Taxi@SG app is that it shows the location of all available taxis from the 28,000 taxis registered in Singapore. Third party taxi booking apps only show available taxis which have signed up with them. 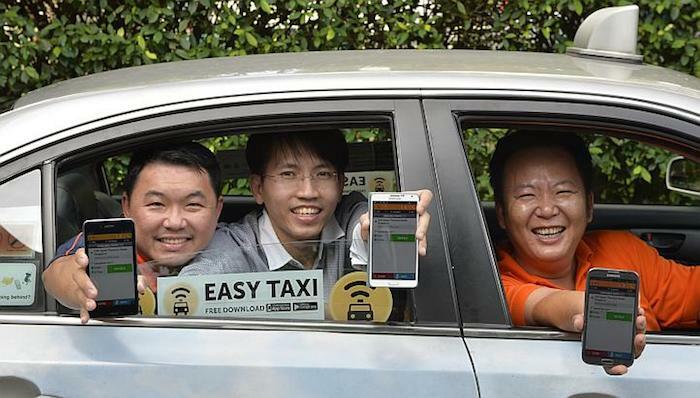 With Taxi-Taxi@SG, riders can broadcast their current locations to nearby drivers to let them know where there is a high demand for taxis too, making it slightly easier to get more riders. “This is part of LTA’s on-going efforts to explore innovative solutions to meet various transport needs. Here, we are translating data gathered from the six taxi companies on the locations of their 28,000 taxis into useful information to better match the demand and supply of taxi services. Commuters who wish to hail a taxi can get a quick sense of the number of available taxis near them, and decide whether it may be better to book a taxi instead. Meanwhile, taxi-drivers can find out where there is high demand for taxis and reduce empty cruising,” said LTA’s Group Director for Innovation and Infocomm Technology Mrs Rosina Howe-Teo. As a frequent user of GrabTaxi and Uber, there are not many reasons for me to download the Taxi-Taxi@SG app. The reason is simple: Taxi-Taxi@SG does not allow me to book a taxi and it does not show me if a taxi is coming to pick me up. So it doesn’t help with the difficulty I face getting a taxi during peak hour. By the time I reach the taxis, they might not be available anymore, especially during peak hour. I could have easily hail a taxi through third party booking apps or simply dial in / sms directly to the taxi operator to get a taxi booking confirmation too. The same goes for drivers. When a driver receives a rider’s location broadcast, it doesn’t guarantee that he or she will still be there in the next few minutes. Perhaps most importantly, drivers do not know the destination and drop off locations of the rider, a problem that has been plaguing the traditional taxi booking consoles this whole time. This is also the biggest reason why taxi drivers are keen on signing up with third party taxi booking apps, allowing them to select customers who are on the way. So as a daily commuter who relies quite heavily on taxis to get around, LTA has probably just released the most useless taxi app ever, simply because at an age where taxi booking apps are so readily available, I’d at least expect to be able to book a taxi at a tap of a button. In the meantime, I’ll still continue to use GrabTaxi, which is currently processing 8 taxi bookings every second around Southeast Asia. Maybe, just maybe, if all the taxi booking apps fail me, I’ll download Taxi-Taxi@SG.